Challenge yourself to solve a 3D Puzzle where you maneuver a small marble around challenging barriers inside a transparent sphere. If you like a great challange then I suggest you try your hand at one of these Perplexus Maze Games. These Puzzle Balls will provide hours of entertainment as you try and work a marble thorugh different obstacles all within a transparent sphere. Talk about working your Fine Motor Skills - you will no doubt do that while trying to master the maze. Oh and best of all - No Batteries are Required, imagine that. So do you think you have what it takes? 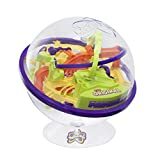 Have you ever seen these Perplexus Maze Games before? Roll the ball to one of the starting points, numbered 1 2 or 3 (suggest starting with #1) If you can´t find them.... put PERPLEXUS down and slowly back away! Flip, twist and spin PERPLEXUS to move the ball along the numbered path. When you fall off the track.... cuz it´s gonna happen.... just start over!!! If you make it to the end, pat yourself on the back... then go get the next PERPLEXUS challenge! 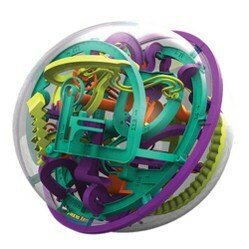 Perplexus works as both a Single Player Game and as a Multi Player Competitive Game. Visit Perplexus' Website for all the variations and directions for Play. Maze Ball Key Chain Buy One Get One Free! Michael McGinnis (the man behind these 3D Mazes) has even created super-sized versions of his original creation that he calls Superplexus. They are all Handmade and absolutely AMAZING !! He would like to create a lot more of them and have them on display in museums everywhere. What also amazes me is the concept for these mazes started back in 1970 when he was a teacher and created his first 3D Maze as an Art Project. After much development, his vision was brought to market in the Toy Verion which is the Perplexus Maze Games that are out today. To think one mans obsession with Mazes turned into a product we can all enjoy in our own homes. I love stories like that don't you? I think these make great gifts for anyone. There is nothing better than Workin' the Mind and I can see these being passed around at Parties, BBQ's, Car Trips and even great for in the Office on your Desk (just hide it from your Boss - lol). Puzzles have come a long way and this is definitely one of them. I really like these 3D Mazes and I also like that everything is contained inside the sphere with no pieces that will get lost. Bonus for those of us with kids. Oh and no batteries - Double Bonus !! I may have to get one for myself and see if I have what it takes to do it - not so sure I would, but it certainly would be a lot of fun trying !! Let me know what you think - a MAZE me !! !